Description: Kick up some fun and get into the Spanish spirit with the #166 Bucky Burro. When pulled, Bucky leans forward then kicks up his back legs so high that he nearly hits the passenger in the cart behind him! The bucking burro makes a realistic "hee-haw, hee-haw" sound as he bucks, his spring tail and ears go wild, and his passenger bounces around in the cart! The faster he is pulled, the faster the burrow bucks. FPT4074 - Bucky Burro - Wooden cut-out burro with four separate wooden legs. Burro has yellow paper lithographs on the sides of his body of a multicolored mexican blanket on his back, a blue harness around the face, and big green eyes. The burro has a spring tail with a red wooden bead on the end and 2 yellow acetate movable ears. His front 2 legs are attached to 2 wooden wheels and his back 2 legs fly up in the air when the toy is pulled. 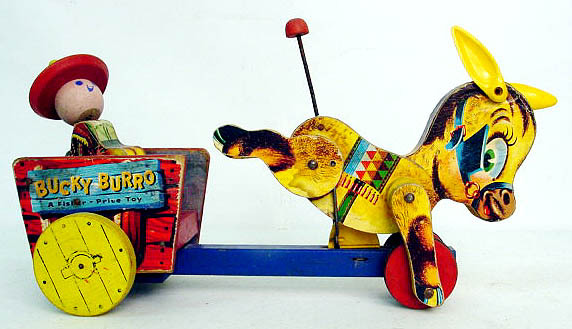 Burro pulls a red wooden cart with a wooden cut-out passenger figure with a round wooden head and a round red and yellow wooden sombrero. The driver has paper lithographs on the sides of his body of a Mexican blanket and clothes. The cart has red paper lithographs on the side to simulate wood and a sign marked "Bucky Burro A Fisher-Price Toy". The cart rolls on 2 wooden wheels with paper lithographs on the side to simulate yellow wooden wheels. Measures 13-1/2" long, 7-1/2" high, 4-3/4" wide.